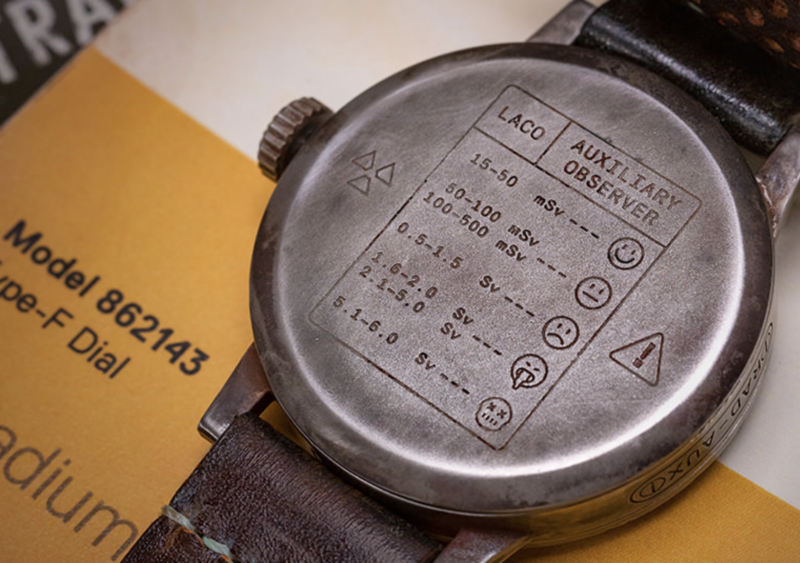 Laco is a small German watch company famous for its Flieger watches – pieces designed for pilots featuring big crowns and legible faces. Now brand has teamed up with ABlogToWatch on a Fallout-themed watch that looks like something pulled out of a deserted vault. 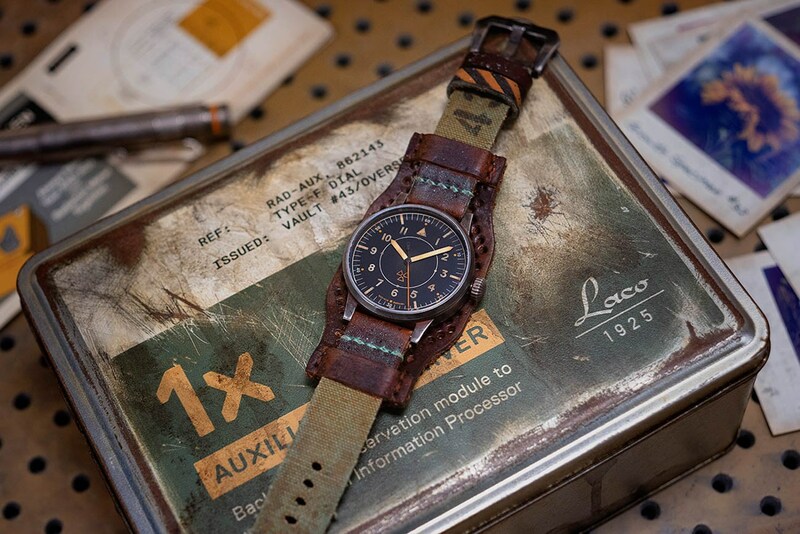 The $2,950 watch contains an ETA 2824.2 movement and features a massively distressed case and band along with a clever case that hearkens back to 1950s A-Bomb/military design. It’s limited to 143 pieces and you can pre-order it for shipment in March. The entire package looks like something out of the Fallout game. Bethesda is not involved in the product, incidentally, but the entire thing is an homage to the Fallout universe. On the outside of the heavily-worn tin box, we see a stamp showing that it was issued to the Overseer of Vault #43. Inside the box, you’ll find the Laco RAD-AUX, a user manual, and an accumulation of a few odds and ends. Presumably, the additional artifacts were collected by the owner of the Laco RAD-AUX before it was discovered. There are realistic Polaroid-style photos depicting abandoned landscapes, mutated plant-life, and a curious panther named Gloria. A bottle cap bearing the mark of a sunset, which has been turned into a pin. There is also a New California Republic ’protection postcard’ which instructs you to place it near the entrance of your domicile, and each item included looks realistically tattered and aged. The most interesting thing about this watch is the partnership with ABlogToWatch, a popular watch blog run by Ariel Adams, and Laco. These sorts of partnerships usually result in a boring, branded watch with an ugly blog logo hidden somewhere on the case. This partnership is more about Laco and Adams’ imagination taking flight over a mushroom cloud. Regardless, this is a great piece for folks who haven’t yet picked up a 3D-printed Pip Boy. Good luck, Vault Dweller! What’s next for the electric Leaf without Carlos Ghosn?